LIVE VIDEO: Trump Holds Spending "News Conference" - Joe.My.God. President Trump is expected to sign the omnibus spending bill he threatened to veto only hours earlier, congressional and administration sources tell CBS News chief White House correspondent Major Garrett. 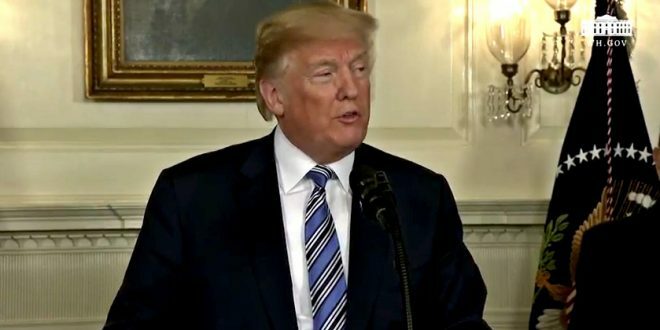 Mr. Trump is expected to announce that in a last-minute “news conference” he announced for 1 p.m.
Mr. Trump shocked Washington Friday morning when he – against every indication from himself and his staff — said he is considering vetoing the bill the Senate passed overnight. Mr. Trump announced the “news conference” after 12:30 p.m. Friday, sending confused communications staffers scrambling. The White House soon clarified that Mr. Trump would have a press availability to take place of the White House briefing, which was scheduled for 1 p.m.